Starbrite's Bilge Cleaner is perfect for dissolving grease, oil & fuel sludge and getting rid of foul odors in your boat's bilge compartment. 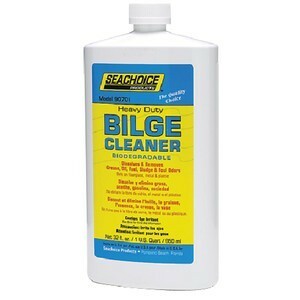 Star brite Bilge Cleaner is perfect for dissolving grease, oil & fuel sludge and getting rid of foul odors in your boat's bilge compartment. Safe to use on your boat's fiberglass, metal and plastic and the best part is it's biodegradable. We love this product because it makes quick, hands-off work of cleaning even the most grimy bilge compartments. Simply apply, let it penetrate, and then rinse off residue and any contaminants at the same time. For extra dirty bilge areas, dilute 50:50 with water, and fill bilge compartment while towing or operating vessel. Agitation will work Star Brite Bilge Cleaner into every corner, ensuring maximum cleaning power. Then simply drain contaminants from bilge compartment, and wipe down for a like new clean, and grease free bilge. Available in quart and gallon sizes, so you can choose the amount you need based on boat size, or how frequent you plan on cleaning the bilge compartment. Stock up and save with the gallon size, and you'll have more than enough to clean in the spring when you're getting the boat out, and in the fall when you put it away for winter.